A reverse sente play is a play which forestalls a sente play of your opponent and ends in gote. 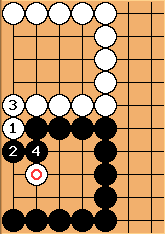 Reverse sente moves are rarely played, as the player with sente will normally be able to play the sente before the reverse sente is profitable. The hane-connect, - , is sente, threatening to save the stone. The hane-connect, - , is gote. It forestalls the White sente and gains 3 points. 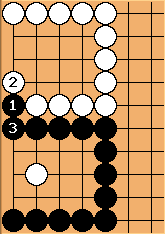 The endgame value of this move is said to be "3 points in reverse sente", which works out to just "3" in miai counting. It is traditional to divide moves into four categories: compare reverse sente with sente, double sente and (double) gote. However, for many years, go professionals have recognized that double sente is problematical. Also, Bill Spight has added a new category for ambiguous plays, which are not simply sente or gote. Sente gains Nothing - One-sided sente plays "belong" to the player who can play the sequence in sente.